LAXPD officers often face safety threats as they work daily and diligently to protect the traveling public at Los Angeles International Airport, one of the nation’s busiest. The last thing they need is bodily threats from exposure to toxic air contaminants that can endanger their health. It’s time to change that. Emissions from diesel exhaust and fumes from planes and transportation such as ground support equipment can be harmful. Studies have found that ultrafine particles emitted from aircraft pose possible health dangers, such as respiratory and cardiovascular issues and cancer. These tiny particles, which are much thinner than a strand of human hair, are breathed in and can lodge deep in the lungs and brain. The highest concentrations of ultrafine particles occur during aircraft takeoff, a 2012 UCLA Fielding School of Public Health study found. Researchers had taken measurements 140 meters from the takeoff location. And the particles aren’t limited to just the airport, a study two years later reported. High levels in residential communities were detected as far away as 10 miles east of the runways, according to environmental and preventive medicine experts from University of Southern California and University of Washington. With an estimated 2,000 flights arriving and departing every day at LAX, that’s a lot of ultrafine particulates being released into the air. Benzene is present in natural gas and petroleum products. A colorless and flammable liquid with a sweet smell, it evaporates into the air quickly. Exposure to benzene can cause leukemia. 1,3-Butadiene is a chemical in petroleum products that can cause blood and lymphatic cancers. It may also harm the reproductive systems of both men and women. Ethylbenzene is a chemical in petroleum products that may increase the risk of cancer. Formaldehyde (gas) is flammable and has a strong smell. It can cause leukemia and cancers of the nose, throat and sinuses. Lead, which is added to some types of aviation gasoline, can harm men’s and women’s reproductive systems and can increase the risk of cancer. Manganese is a metal found in certain metal alloys, such as steel. It can harm memory, thinking, mood and balance in adults, according to the California Environmental Contaminant Biomonitoring Program. The program is a collaborative effort of the California Department of Public Health in the Health and Human Services Agency and the California Environmental Protection Agency’s Office of Environmental Health Hazard Assessment and Department of Toxic Substances Control. Nickel, a chemical in petroleum products, can cause cancers of the lung, nasal cavity and sinuses. Naphthalene exposure may increase the risk of cancer. Toluene, found in petroleum products, can cause birth defects or other reproductive harm. Many of the above toxins — benzene, formaldehyde, acetaldehyde, 1,3-butadiene and lead — are among the 40-plus chemicals that are in diesel engine exhaust. The fact that these contaminants are known and present should trigger efforts to reduce the exposure of airport workers and LAXPD officers. On the national front, the House of Representatives in April passed the FAA Reauthorization Act of 2018, allowing commercial airports to not use firefighting foam that contains cancer-causing contaminants. The Senate considers the legislation next. And Washington state in March banned firefighting chemicals that may cause cancer. What Can Be Done in L.A.? Continuing the “what if” theme of the previous LAAPOA newsletter, what if LAXPD had the resources to invest in protective gear and measures to reduce members’ exposure to toxic air contaminants? 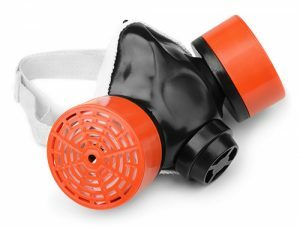 About 5 million workers have to wear respirators in 1.3 million job sites across the country, the Occupational Safety and Health Administration says. Wouldn’t respirators that could limit these ultrafine particles from being inhaled be helpful and healthful for airport personnel? Our peace officers already face conditions that alone can contribute to obesity, heart disease and post-traumatic stress, not to mention constant threats of accidents and attacks in the course of their work. They shouldn’t have to worry about environmental stressors as well.